You are currently browsing the tag archive for the ‘Copper Country’ tag. 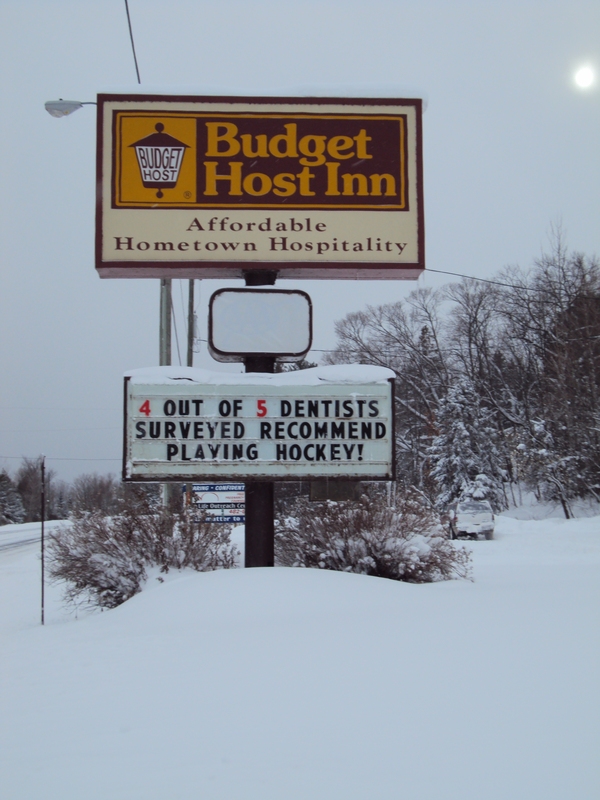 Four out of five dentists surveyed recommend…playing hockey! We had to drive up to Houghton. Barry had to interview someone, and he dropped me nicely at a coffee shop to sip cappuccino and play on my laptop computer, also known as Miss Ellie. I wore sneakers up to Houghton, the first bad decision of the day. The good decision involved throwing in a pair of Sorel boots in the back seat of the car. After getting a good case of frozen sneaker-feet, I switched to the Sorels and clumped around during our later shopping expedition. 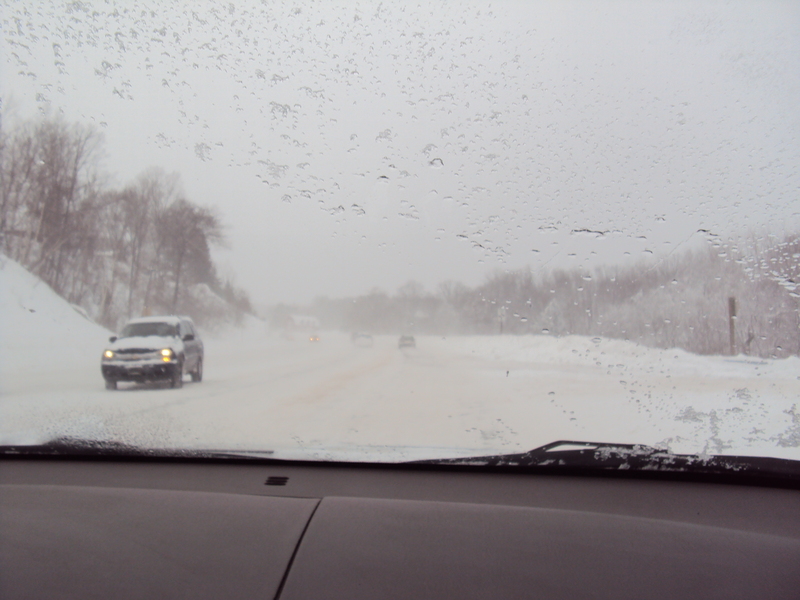 The snow was still coming down in white sheets in the Copper Country. 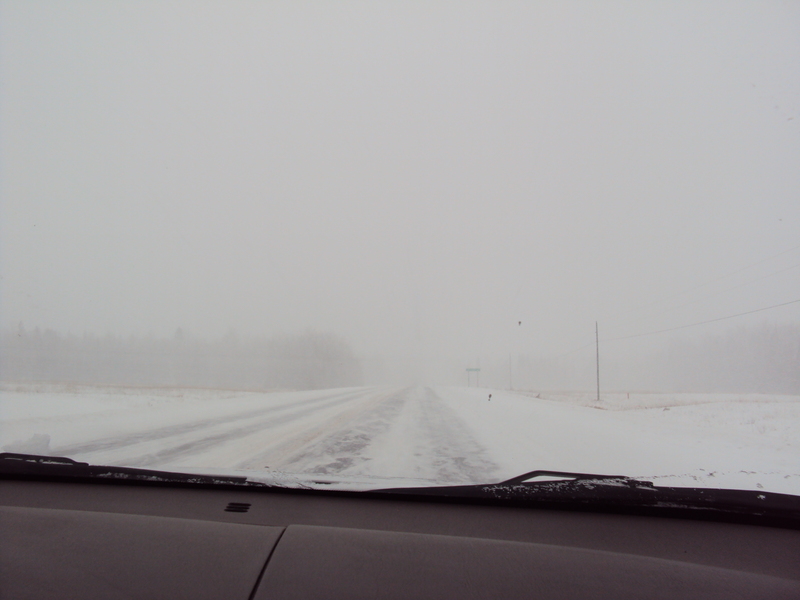 Once you drive across the Houghton County line, you can expect the weather to worsen. It almost always does. Usually within a mile or so of the county line sign. People in the coffee shop moaned that the weather forecaster predicted up to ANOTHER two feet of snow up there in the next day or so. Yikes! We can always thank our lucky stars for living in the “banana belt” of Baraga County, especially in our locale near the Huron Bay. After all, our storm abated after about fifteen inches of snow. I was glad Barry drove. The roads were not stellar. They combined ice, snow and slush into a mixture that kept us alert and cautious. The white-out conditions in the Copper Country added to the fun. However, we did accomplish all our work and shopping. After we turned around to drive home, passing by the county line, out came the sun! Houghton County may still be getting lake effect snow, but we’re feeling like the tropics down here. 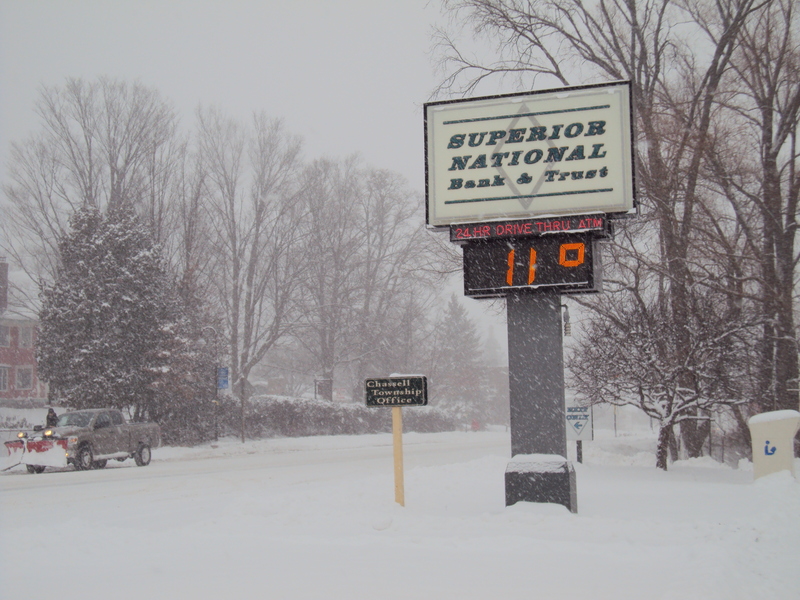 After all, our thermometer read 14 degrees! Welcome winter!! The sun breaks through! We're back in Baraga County. P.S. Today’s outdoor adventure (besides running between stores) involved shoveling most of the deck. A very good upper body workout. I wonder if four out of five dentists would recommend shoveling? Hmmm…. Have you heard how the Australian Aborigine people go “walkabout” when they undertake a vision quest? They undertake a spiritual journey to renew their relationship with the landscape and their Dreaming. We modern-day folk here in the U.S. of A don’t usually “go walkabout”. But recently I felt called to do a “driveabout” through the Copper Country, following random roads, letting the inner spirit guide the journey. Wherever the spirit pointed, I drove. Up hills and down. To the lake and the coffee shop and the Goodwill. The secret is to listen intensely and deeply to where you are suppose to go next and what you are suppose to do. Without letting the planning organizing Mind take control. First stop: dawn meditation. Watching the sun rise over Lake Superior. Many insights and visions and thoughts and knowings arise as a driveabout happens. Your inner voice may share, teaching you many things. Sometimes Silence teaches. Sometimes you watch what appears: the trees, the lake, the hawks, the stones. You always stay alert to glean what the Universe may be attempting to teach you. Sometimes you can’t figure it out, but a lot of the time you can. Why is there a crutch leaning against that stop sign and what does it mean...? OK, there were a LOT of stops along the way. I was guided here and there, there and here. Bought a lot of strange and cool clothes at Goodwill in styles that I have never worn before. Delightedly sipped lattes and coffee at two coffee shops along the way. Ended up along a mostly-deserted stretch of beach near Gay, Michigan. I haven’t been to Gay since 1997 and it was a definitely spiritual experience back then. Today I found myself exploring the rock beach (it’s so amazing how every beach is so different with its own individuality and colors and textures!) Spent at least a couple hours alongside Lake Superior gazing our to sea, eating a picnic lunch from the Keweenaw Co-op, picking wild blueberries, meditating. So tonight, after a day of following my heart in its many directions, I am resting (complete with wireless Internet!) at a lovely motel in Calumet, Michigan. Two of the final events of the day involved (a) swimming in the motel’s saltwater pool, after thanking all the powers that be that I remembered my bathing suit and (b) eating chicken fajitas with rice and beans at Carmelita’s restaurant. The spirit of the the driveabout insisted upon both. Jeez, I have 53 photos I could show you. But this shall have to suffice. One final photo before departing. It turns out that Carmalita’s Restaurant boasts that it is the home of the original Thimbleberry Margarita! A thimbleberry margarita, can you imagine that? I might have had one if I had noticed the sign…but that might have been a bit too much of an experience for the driveabout. Heading up to Copper Harbor tomorrow. You might want to get out your map to see where that is. It’s waaay up here. Waaay up at the very tip-top of the Upper Peninsula. You can’t go any further. In fact a sign along the way will declare that this is the “Last Place on Earth.” Hmmm, I wonder what that means?? Hope to see you tomorrow! Nephew Doug comes to Michigan Tech! Another family member has become a Yooper. A resident of Michigan’s Upper Peninsula. It’s my nephew, Doug. He’s attending orientation tomorrow at Michigan Technological University in Houghton. And, lucky us, he traveled up north with my brother, Scot, his wife, Karen, and sister Keely. Tonight I am coming to you live from the Cyberia Coffee Shop in downtown Houghton after hours and hours and hours of outdoor adventures. I am soooo tired. But will attempt to type faithfully, upload photos and stammer out a narrative. We ate a rather nice meal sitting out on the deck at the Downtowner Bar and Restaurant watching the sailboats and power boats and talking about Mount Ripley and winter skiing. Doug already seems to know more about the Keweenaw after one day than I do after thirty years. (Well, maybe not, but that kid sure knows a lot!) His roommate, Gabe, seems like a nice fellow and I’ve promised to call them when I’m up in Houghton. Maybe we’ll even come back to this coffee shop some morning in between class. Or perhaps we’ll meet for lunch. I am SO thrilled to have an extended family member this close. After a leisurely dinner in which we sat next to other friends, we wandered downtown to watch…are you ready for this?…the band “Wolfgang” play for the Thursday night concert series. And guess who plays bass guitar in the band Wolfgang? You guessed it, I’m sure. My husband, Barry. The streets in downtown Houghton have been torn up for most of the summer. They have been digging up the old street and replacing it with brick. You have to maneuver through a series of detours to make your way around the city. It’s been challenging. The concert series was probably intended to keep folks in the downtown area. Wolfgang plays classic rock ‘n roll. It’s fun to listen to them. A lot of the time they play bar gigs or weddings, so I don’t have an opportunity to hear them that much. It was especially fun to sit on the curb between Scot and Karen, swaying to the music and sometimes singing along. Keely bought some fudge. It was a lovely warm summer evening; a novelty in the Copper Country this summer. We’re planning a hike to the Sturgeon River Waterfalls tomorrow, if it’s not raining cats and dogs. If it’s drizzling lightly, we’ll go. 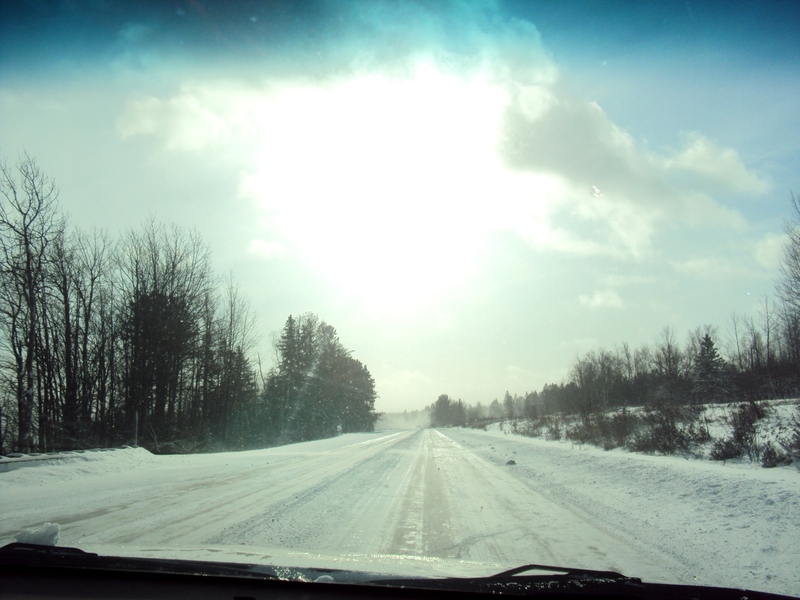 We may even do more sightseeing around Baraga County…trying to figure out where to take guests…and which places might make a good outdoor blog! It is this kind of summer night which sustains us through the long cold winters. Memories of twilight wearing shorts and short sleeves, moving to the beat of good music, spending time outdoors with family and friends. Today I convinced Barry to explore a haunted and overgrown stretch of outdoors in the Copper Country. Old crumbled buildings sink into the earth, and tangles of brush and trees rise everywhere. The earth smells different here, as if memories of yesterday still linger in between the old fallen rock walls, in that silent building, beneath trees which keep long secrets. You walk quietly among the old ones, never sure what might collapse beneath your feet. Caution keeps one alert. The steep slope of the hillside also makes you sure to stay balanced and upright. Oh how fascinating everything was in its spooky aged splendor. How I wouldn’t want to be here under a full moon on Halloween Eve! We bickered back and forth about who got to carry the camera. Each of us kept deciding such-and-such angle looked more interesting or provocative. It’s amazing how two people can look at the same landscape and see different angles, different shots, different perspectives. The dried leaves of this tangled undergrowth were dotted with very strange fungus-like black spots. It makes one wonder why. What created those black stains? Human-made by-products leaching on the soil? Or something else? The trees in the woods around our house are not usually covered with vines. Therefore, when one spies a vine-covered tree it becomes utterly intriguing. It’s as if the undergrowth attempts to merge with the tree. It added to the mystery of the place. Well, I’m here to report that we googled it and Amanda Palmer was not a local girl. It’s a play, a book, alternative punk-flavored music. You may even have seen it playing around the country. In fact, we may be the very last people on the planet to have heard about Who Killed Amanda Palmer. But we’re educated now. Barry, in a classic rock band for 20 years, found the pounding piano-driven music refreshing! It certainly wasn’t hip-hop and it wasn’t country twangy–and it wasn’t rock. But who killed the girl, anyway? You just have to wander around outside in spooky overgrown areas and…you never know what you might learn or discover. Something new every day.